Just in time for peak travel season, dead fish have been washing ashore on some popular Lake Michigan beaches. Most recently this has been happening in parts of the Sleeping Bear Dunes National Lakeshore. 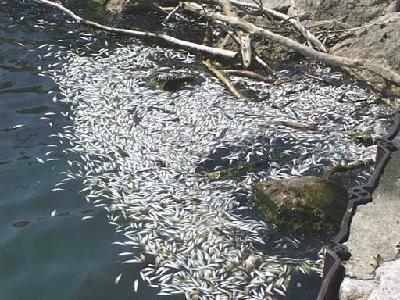 But while this is certainly unpleasant for swimmers, it signals some good news for the state’s sport fishery. These little, silver fish are called alewives. They are an invasive species - they weren’t originally designed for the cold waters of the Great Lakes. Their numbers exploded back in the 1960s. Jay Wesley manages the southern Lake Michigan fishery for the state of Michigan. So alewives feed salmon, and these days state fisheries managers like to see them do well (even though the salmon are not native to the Great Lakes either). No one likes die-offs, which mean the fish are stressed coming out of winter and heading into the spawning season. But since they’re not totally adapted to this habitat – it’s somewhat inevitable. The die-off is also evidence there’s food in Lake Michigan for salmon. It's good news, because anglers have been nervous. In the last decade or so, alewives haven’t always done so well.